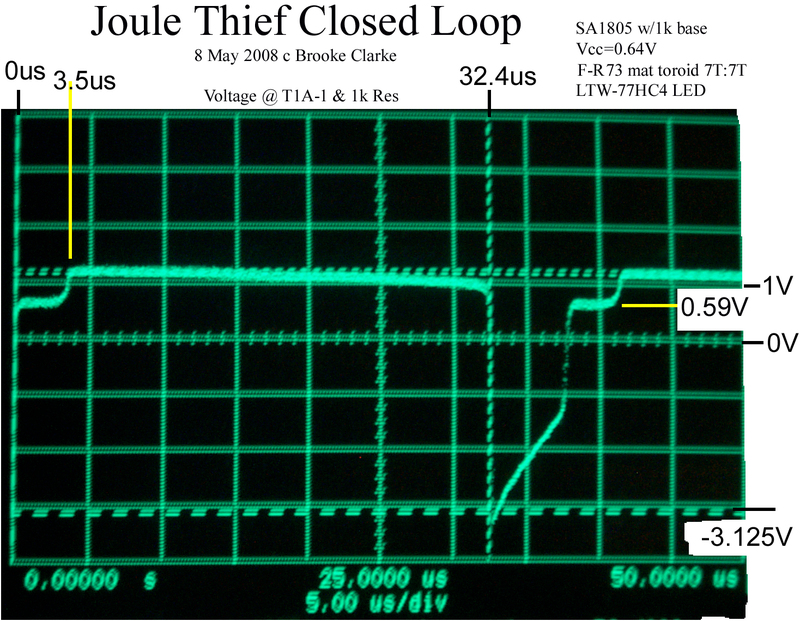 To be called a Joule Thief I think a circuit needs to be able to start when it's input voltage is below 1.0 Volt. That's because one volt is one of the definitions of a dead single cell battery. So if a circuit can start up on less than that it's stealing energy that would have been thrown away if the "dead" battery was put in the hazardous waste. The lower the starting voltage the more energy a circuit is capable of stealing. But coupled with low starting voltage a circuit needs to have enough output current to do something useful, like lighting a LED or powering something useful. For example there are some MOSFETs that can be used to make a multivibrator that will start at 0.16 Volts, but if it can't drive anything that circuit is not a Joule Thief. A blocking oscillator is a circuit that can be made into a Joule Thief by selecting parts that allow low voltage starting and is the most common circuit. 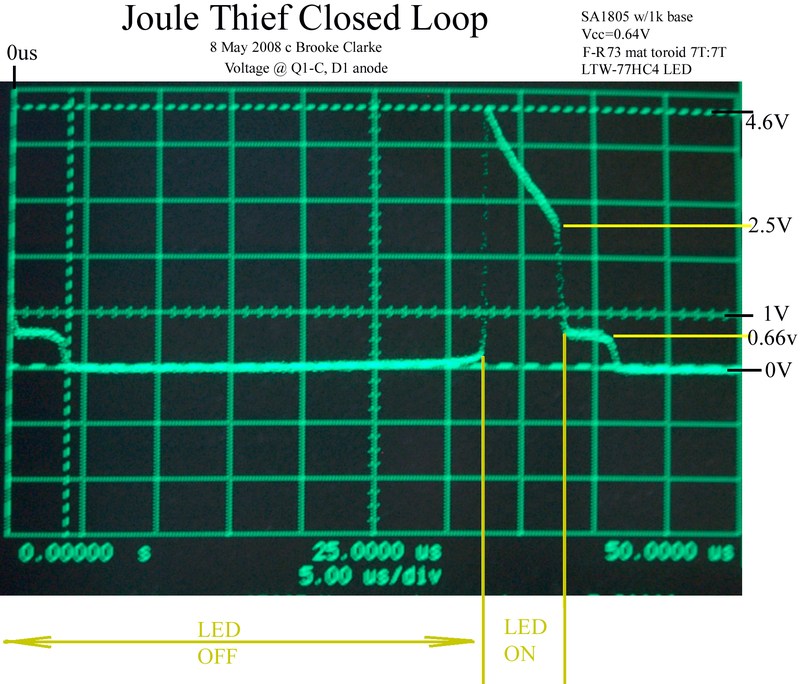 Most inverter circuits will not start at low enough voltages to be called a Joule Thief. The Joule Thief is very similar to the Flyback Converter (Wiki) but it does not have metallic isolation between the input and output. The Forward Converter (Wiki) is more efficient than the Flyback Converter. 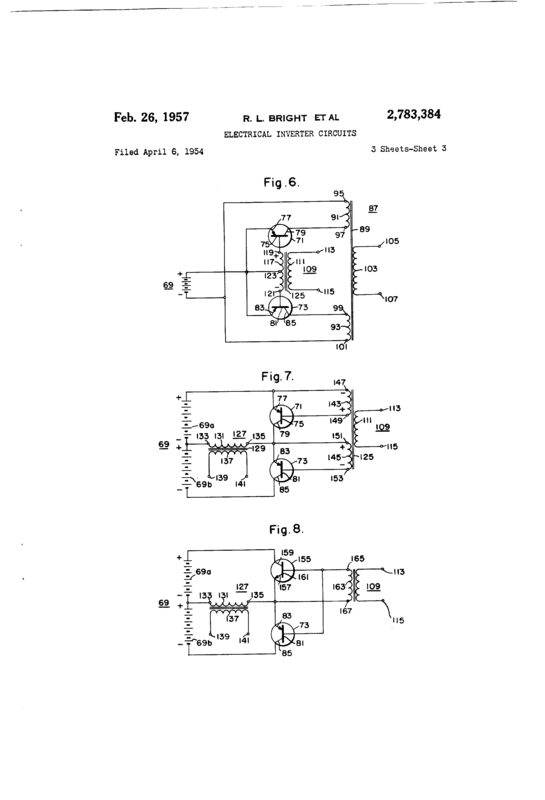 4696639 Self-energizing Burner Control System for a Fuel Burner, John E. Bohan, Jr (Honeywell), Sep 29, 1987, 431/59, 431/90, 331/66, 137/66, 431/42 - complete circuit including the oscillator. EEVblog #664 - Peltier TEG Energy Harvesting Experiments - LTC3108 data sheet has info for 100:1 transformer suppliers. There are some circuits used with very small solar cells to power motors that make use of a voltage detector IC such as the Panasonic MN1381, Maxium MAX8212, Microchip TC54, etc. These CMOS circuits close a switch to ground when the voltage falls below some minimum voltage (they come in many voltages or allow setting the trip point with external resistors). 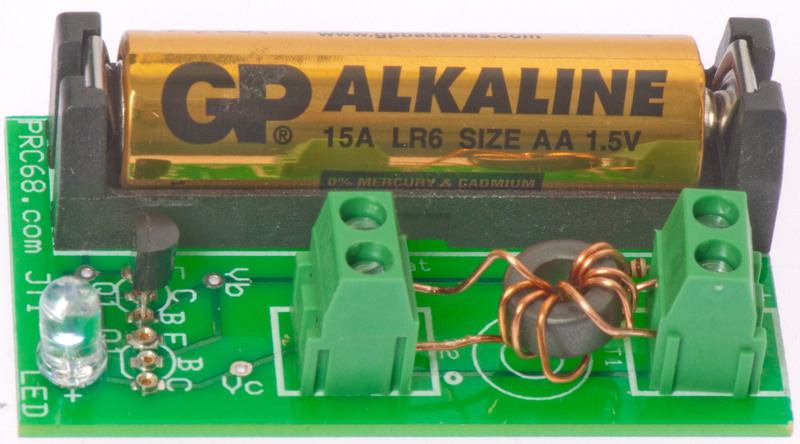 This way an energy storage capacitor can be charged by the very small solar panel then discharged into the load. An example is the MSE2. The Panasonic poly crystal solar cell generates electricity even when it's cloudy. The motor runs once every six minutes for about six seconds. When in direct Sun the motor runs for about six seconds with a pause of a few seconds. Note: the business card size assembly instructions were for a different version MSE and incorectly showed the two TO-92 components with the flats up. You can see (click photo for a larger version) that the diagram on the board shows the flats down. The Brown Fluxgate patents are based on a blocking oscillator that's modified to use less power, prolong battery life. 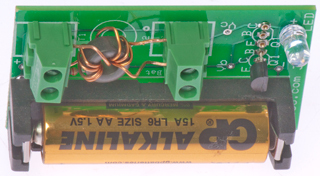 Note an induction coil generates a back EMF or kick when it's drive current is interrupted. Automobile spark ignition engines use "spark coils" to step up the vehicle low voltage DC to many kilovolts to fire the spark plugs. PCB about 1/4" x 1"
to allow setting the turn off and turn on brightness. A little over 2 uS on time. 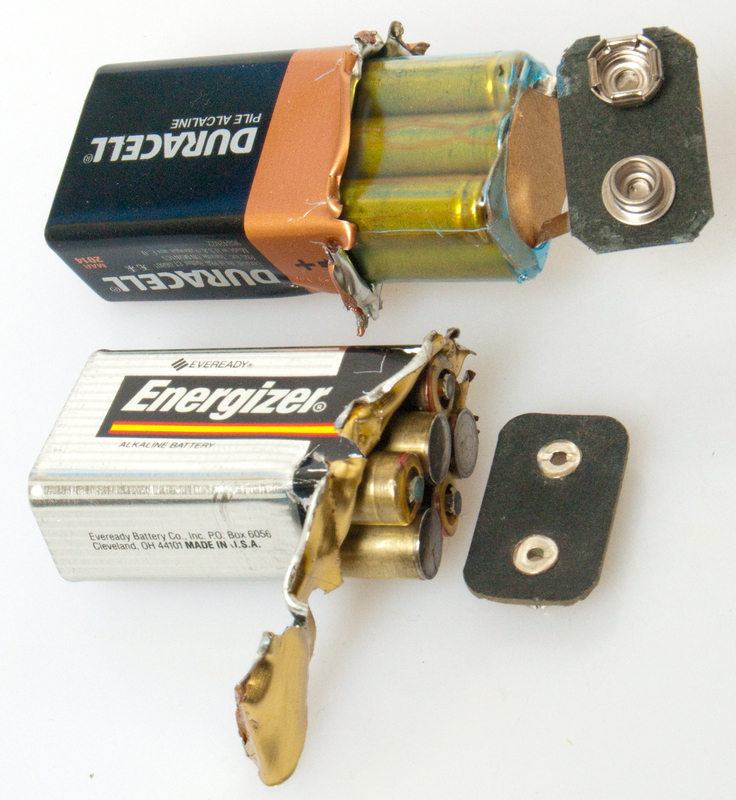 Opened Rayovac and Energizer 9V battery showing AAAA cells. but their polarity is backwards, i.e. point is negative. There's three jumpers in the energizer base each connecting 2 cells. smaller than the 45mm x 45mm panel op the Home Depot light. 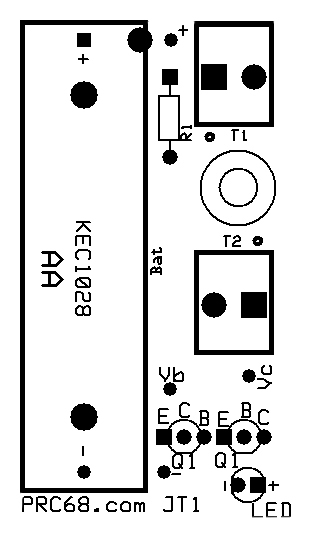 This light has the QX5252E mounted as a Chip On Board (Free Dictionary) on the back of the PCB. The battery is a 2/3 AA size and is rated 150 mAh, the lowest capacity I've seen. I wonder how long and how bright this light is? The Home Depot on the left is a warmer light. My tripod repair part has not arrived, expect it tomorrow. When the Sun is shining the solar panel charges the battery because the voltage on the SBat terminal is higher than on the Bat terminal. Note: the battery voltage is much less than the forward voltage of the LED so only a very small current flows through the LED and inductor during charging. Note: the QX5252 terminal Lx is open during charging. At night the voltage at the solar panel drops below the battery voltage enabling the light circuit. The FET turns on shorting out the LED and connecting the battery and inductor in series, thus charging the inductor. When the inductor is fully charged the voltage at the Bat terminal has dropped from about 1.4 V to zero at which point the FET turns off. When the FET opens the inductor generates a voltage kick that's added to the battery voltage to turn on the LED for a very short time. The voltage (with no load) is equal to the inductance times the rate of change of the current (Wiki). After the inductor is out of energy no current flows through the inductor or LED. If it's still dark the cycle starts over. 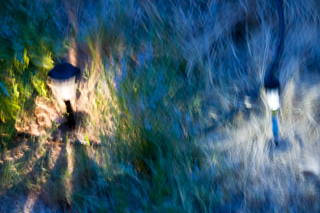 This Solar Path Light retailed for $2.88 at Home Depot meaning that it is a very low cost product. This circuit is lower in cost than one that uses a two winding transformer like the classical Joule Thief. Another way they get the cost low is using a way undersized battery, i.e. 250 mAh. I'm guessing that inside the AA case is really a AAAA battery (Wiki), see the photo above of opened Rayovac and Energizer 9V batteries showing the 6 AAAA cells inside. Note: capacity based on 25 mA load. Wiki lists the capacity of the AAAA Ni-MH as 325 to 500 mAh so the "Solar" brand battery has low capacity even for a AAAA size, i.e. it's very cheap. I upgraded my Solar Path Light by installing the Imedion Ready To Use battery which should increase the "hours of operation" from the sticker value of 1 hour to at least 8 hours. but the top black plastic is turning to dust. This may be the circuit in one of the old patents. 7 out of 7 of these that were not working after installing a new battery were fixed by using a small file to clean the positive battery contact and the positive end of the battery, then putting a small dab of Silicon grease on the positive end of the battery. The idea is that the Silicon grease will keep out the battery fumes that are making a very poor connection. 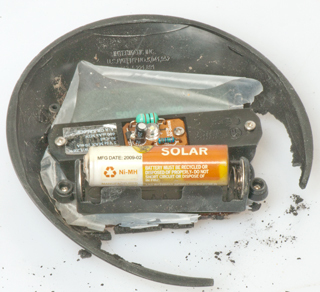 To test this just put a small screwdriver blade between the battery positive end and the light battery contact with the solar panel down and shielded from light. If the LED lights then that's the problem. These have battery date codes of 2009 (it's June 2013) and are either dead or nearly dead. To open place a knife blade gently between the black top and the narrow clear plastic ring and gently pry. If it does now separate a little move a little and try again. After a few tries you will be able to remove the top without any new damage (the Sun has already done a lot of damage). Remove the old battery and install a fresh high capacity Ni-MH cell. 6 of 8 of the electronics units still light the LED when the solar cell is face down on a table (in the dark) and 1.3 VDC is applied to the battery terminals. 1 electronics still works even thought the surrounding black material has crumpled into dust. It may be transplanted into a mechanically good but electrically dead unit. Need to check the solar cells as a couple of them look like they may be dead. The IC is a Chip On Board so it's not at all clear how the circuit works, but it does have a 2 lead axial inductor like the unit above. I started looking into a Blocking Oscillator as one way to power a High Brightness LED from a single cell battery (Alkaline, Ni-MH or a No. 6 Dry Cell). The early work is on the LED web page. But it's getting more involved so am starting a new page. Blocking Oscillators are also used in many other applications. 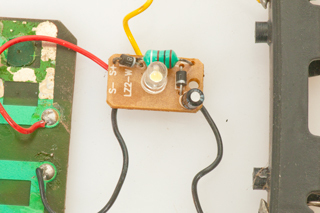 For example if you remove the LED and replace it with a series connected high voltage diode and capacitor and add a third winding with many turns you can generate high DC voltages like used for flash cameras. With the 7 turn coil unit if the LED is removed the T1B pulse is about 85 volts. The blocking oscillator is also used in some sea mines to power a flux gate magnetometer. They can also be used to drive a piezo disk. 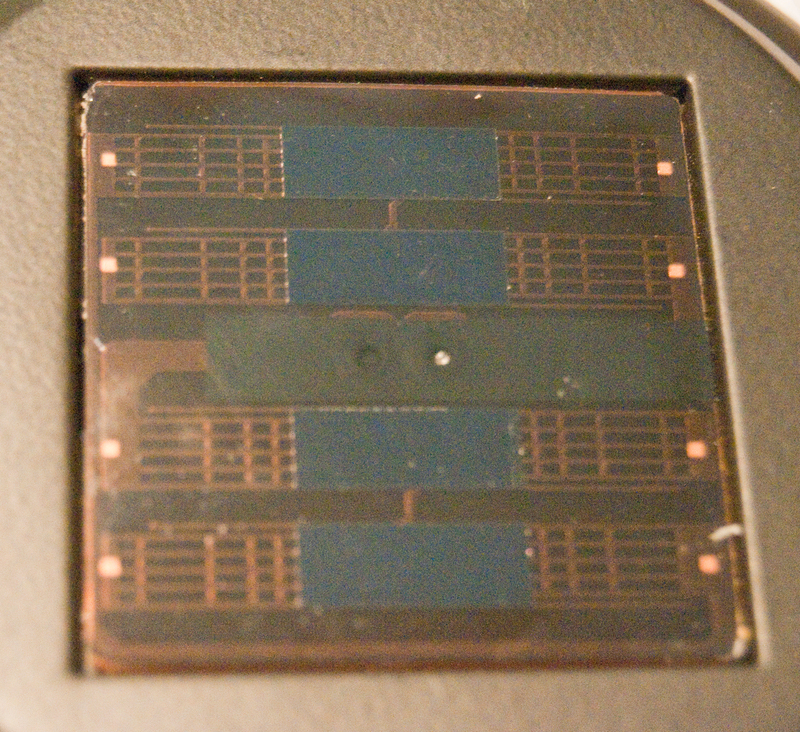 Single Use Cameras use a blocking oscillator to generate the flash High Voltage. Working with the Fair-Rite toroid in 43 and 73 material everything seemed to work. 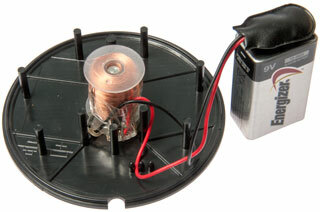 The transformer is wound on a toroid of the same type as used to wind inductors. But the 85 material (square B-H) did not. To investigate why a working unit using 73 material was measured again. I suspect that a different winding is needed with the 85 material. Here it is. 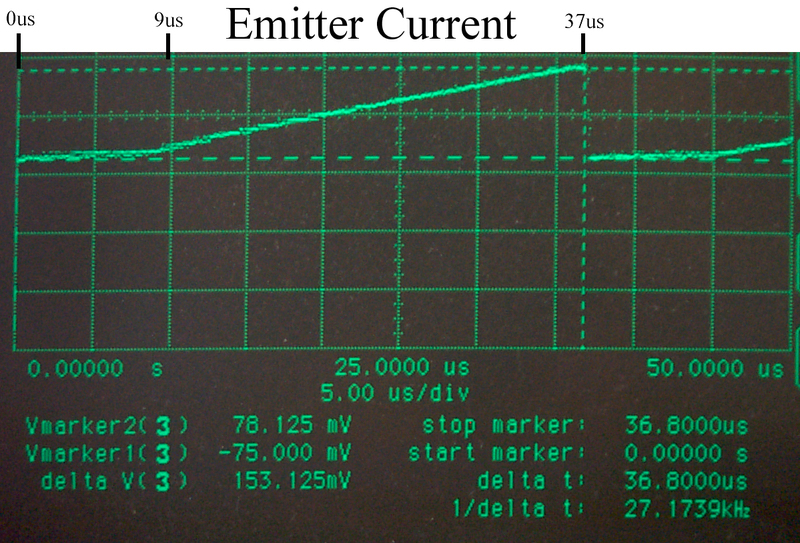 Emitter current measurement was made by inserting a 10 Ohm resistor between the emitter and ground. 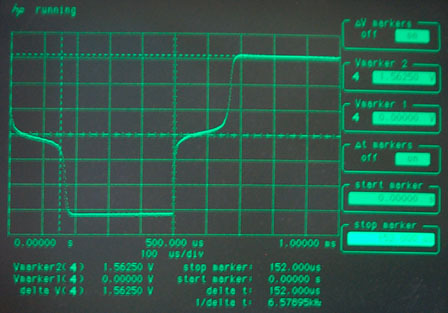 This radically changed the operating parameters of the circuit. But you can see that the current is rising during the LED off time. the current gets to 32 ma. Notice that in this case the current has a linear ramp back to zero lasting about 1 us, i.e. that's the LED on time. Then there's a delay of about 3+ us before the linear ramp up in collector current. "You can speed up transistor switching time by adding capacitor (ca. 1nF) parallel to R1 resistor." 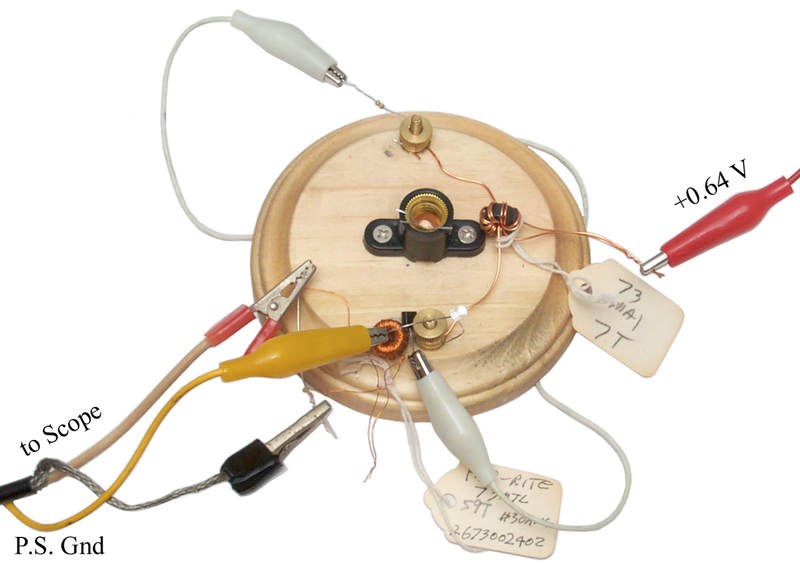 This is a circuit that uses push-pull transistors to drive a transformer. This design depends on a saturable core material, i.e. with a rectangular B-H curve (Fig 2 on sheet 1). 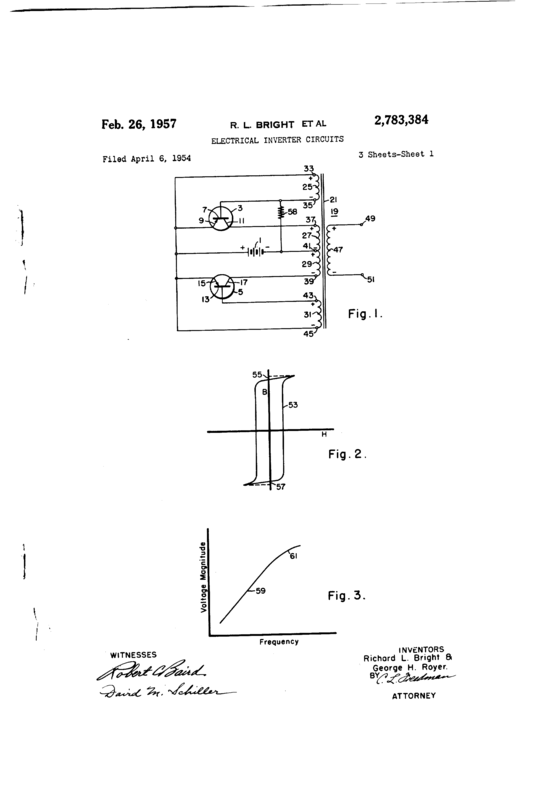 2915710 Magnetic coupled transistor oscillator, Arthur J Schiewe, Chen Kan, Westinghouse Electric Corp,1959-12-01 - a Joule Thief version of the Royer - Magnetic flux swings from starting point to positive saturation and back. 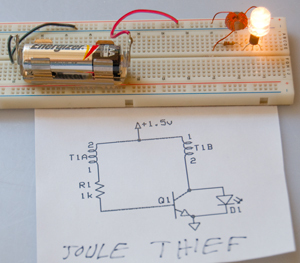 Joule Thief - to promote circuits that work on dead single cell batteries. Motivated by the Mini Maker Faire at the Mendocino County Museum on 25 May 2013 I'm designing a Printed Circuit Board that will allow changing all the components without soldering. 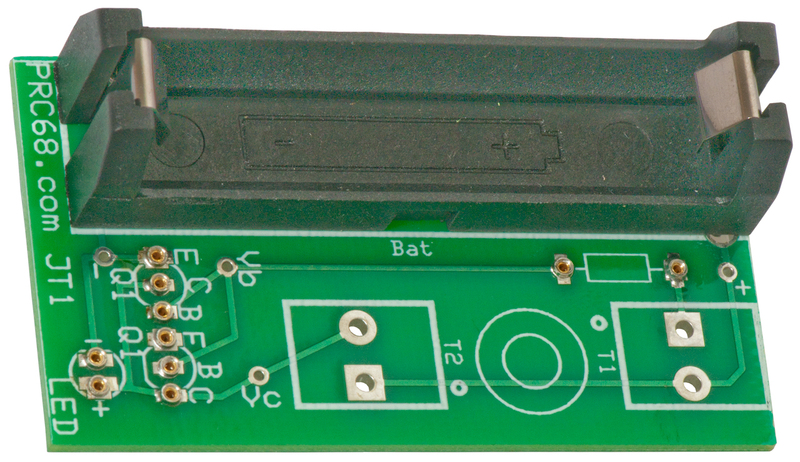 It will have a AA battery holder mounted on the board with solder pads to add an external battery instead of using the on board AA. 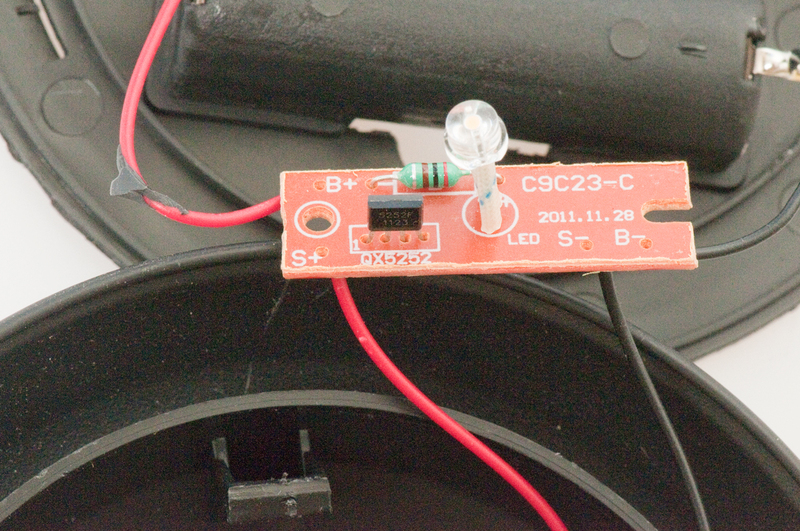 In a like manner it will be possible to solder wires for a external LED. If you are interested in buying one of these printed circuit boards either as a kit to be soldered or already assembled let me know. This is a Joule Thief made from the schematic above just to try some parts. This is one way to experiment, but requires more experience than a purpose built board that has component markings. Q1: Fairchild KSD5041, NPN transistor made for use in single use flash cameras for High Voltage generation from one AA battery. This circuit will start at 0.5 Volts so can be powered by "dead" flashlight batteries, i.e. 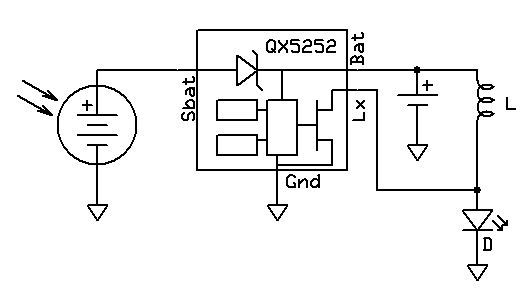 the battery doesn't work in the application but will power this circuit. D1: Warm White LED from Electronic Goldmine Stock No. G18242. Warm White simulates a filament lamp or kerosene lamp and is a lot more pleasing to the eye than the "white" LEDs that have a lot of blue content. The beta version has two socket configurations for Q1, one has the lead order E C B and the other E B C to match the two most common lead arrangements on TO-92 outline transistors. R1, Q1 and the LED have sockets so the components can just be pushed in. The transformer has screw terminals for all four wires. 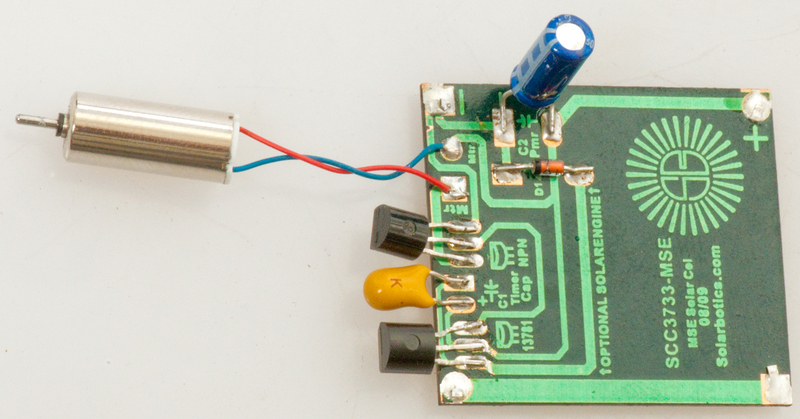 Test points for Vb and Vc, wires can be soldered to make it easier for oscilloscope test leads. Provision for soldering wires for an external battery marked + and -. An external LED can be used by plugging wires into the LED socket. 28 May 2013 - The PCB, sockets & AA Battery holder have arrived and been assembled. Waiting for the two dual terminal strips for holding the transformer wires. * troubleshooting ideas for when it does not work??? 1. reverse the transformer leads on one of the terminal blocks. What should be included in Experimenter's Kit? It turns out that the range of wire diameters that socket will accomodate is not large enough to handle the range of common parts so the idea does not work. 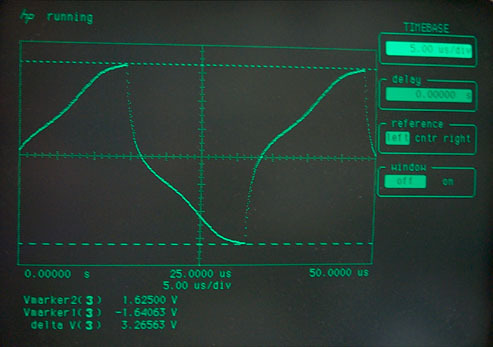 The LED is connected across the transistor Collector - Emitter junction so the collector voltage shown in Fig 4 is the same as the LED voltage. 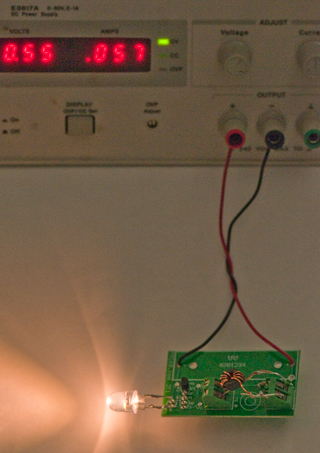 Since the power supply is a single cell with a voltage between near zero and 1.5 Volts some boost is needed to light the white LED (Vf nominal 3.4 Volts). The boost comes from the collapsing magnetic field in T1. 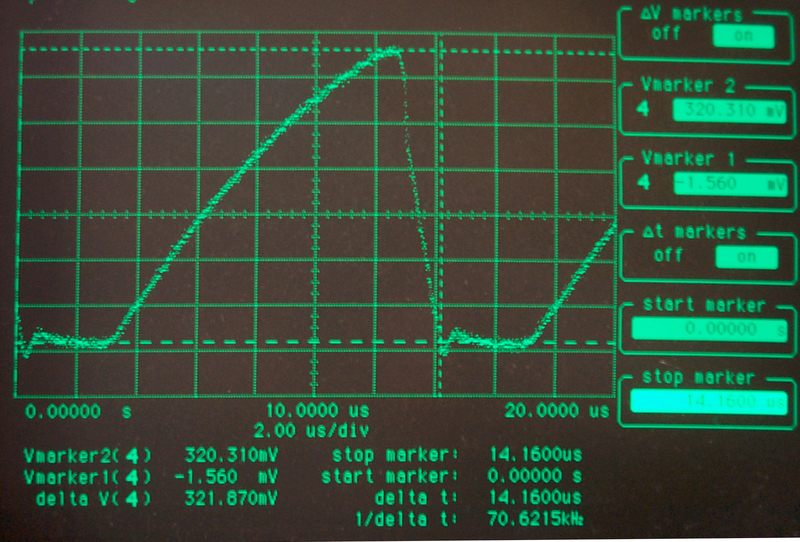 Then the transistor is turned on and the collector to base voltage is very low (32 mV in Fig 4). The current in T1B starts ramping up until either the transistor saturates or the core saturates or maybe both are happening. 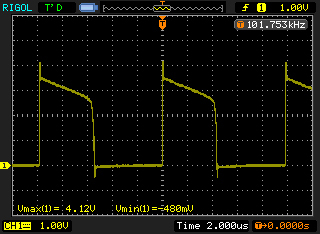 When the rate of increase of T1B current decreases that generates a voltage in T1A that turns off the transistor. To estimate the collector current using the value of collector voltage. For making calculations relating to the toroid the current through the coil is needed. 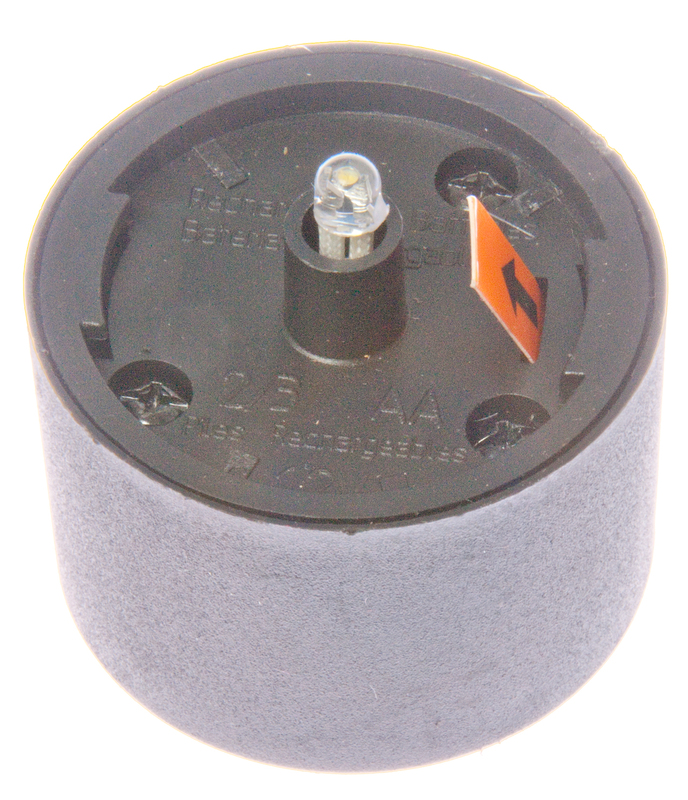 May 8 2008 (05/08/08) Triad CST206-3A 300T current transformer on order. Expect by end of May. Using the Fair-Rite 73 material transformer used above with two windings of 59 turns each (see above) with the center tap where the power supply was connected not used. 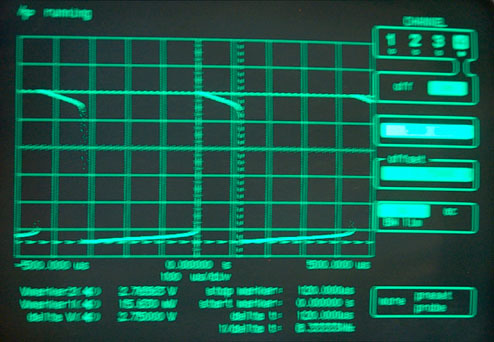 To calibrate a single wire was passed through the center and driven by the HP 33120 with a 10 V pk-pk square wave. Since it has a 50 Ohm internal impedance the calibration current is 200 ma. 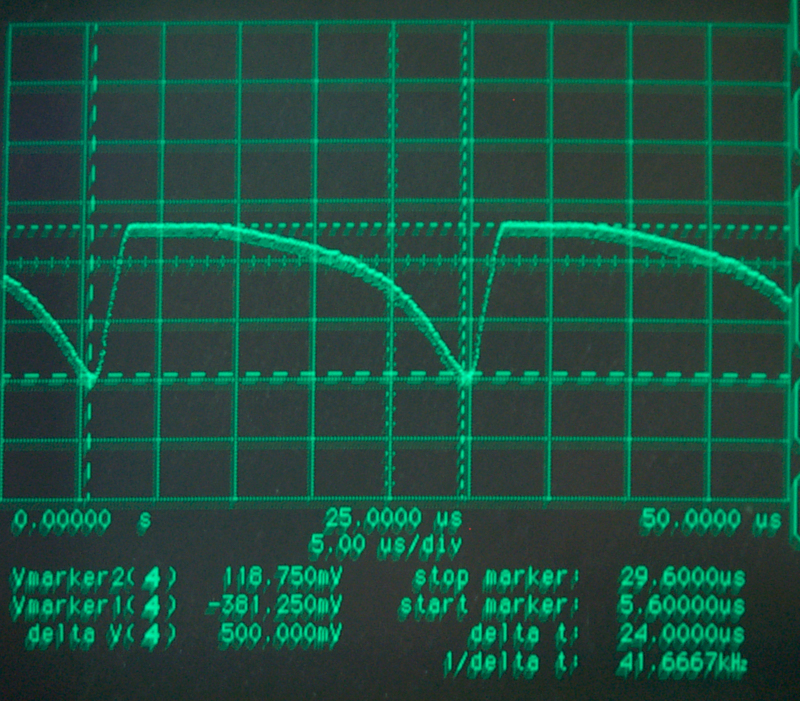 The scope displays 171 mv so the cal factor is 1.17 Volts/Amp. This plot is not showing a linear ramp down from the peak current but instead a step. That may be because this is not an optimum current transformer. The output of a current transformer needs to have a resistive load since it's output is a current, not a voltage. By choosing the load resistor you can end up with a "nice" Volts/Amp conversion constant. That's probably why the output looked wrong. The current transformer is NOT DC coupled. The DC level will average to zero. The vertical channel has zero volts offset and is 100 mv per division. 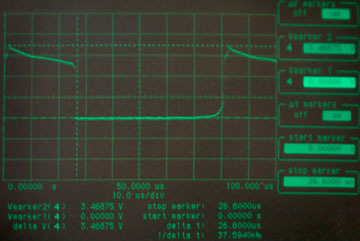 During the LED off time the current through T1B and the transistor C-E junction ramps up until the transistor is turned off. That transition is the trigger point at the left edge of the scope. 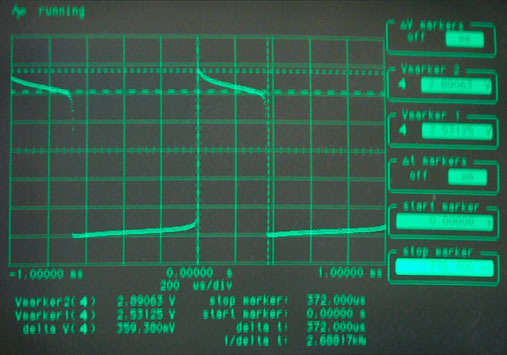 Immediately after the transition the transistor current is zero which allows setting the DC levels on the waveform. Adding 75 mv gives the DC levels. 0 ma at the left edge and ramping up to 180 ma. 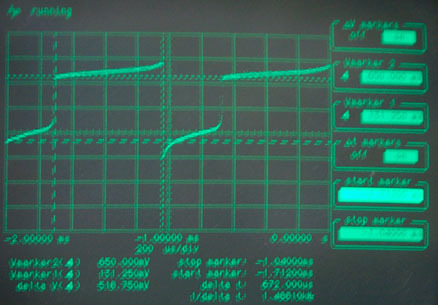 The power supply is showing a current of 74 ma. 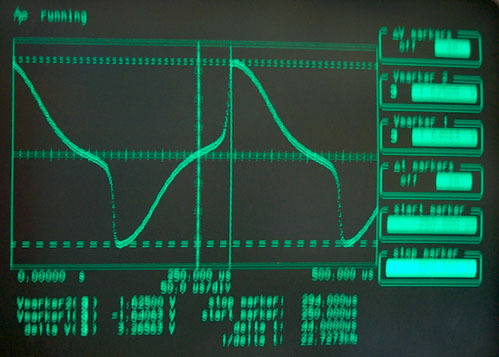 The emitter current does not include the LED current so a seperate measurement was made of the total current which turns out to have the same peak to peak value but looks more like a sawtooth (does not have as pronounced a flat part). A linear ramp from zero current to 180 ma has an average value of 90 ma. But this is over 32 us and the other 5 us of the period there is no current so the average current would be 32/(32+5) * 90 = 77 ma which is pretty close to the meter reading of 74 ma. R1 sets the base drive. Decreasing R1 increases the transistor base and collector currents and more coil current means a brighter LED. As R1 is inecreased a point is reached where the LED is no longer on. At this point the circuit is still oscillating but the peak voltage at the LED (same as the collector voltage) is just below the LED turn on voltage. 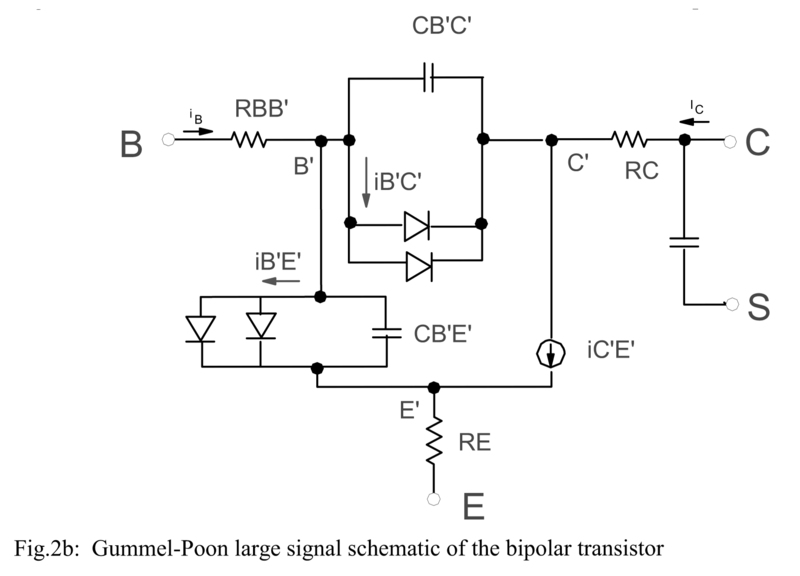 There are a number of special requirements for this transistor. First off it must operate with low voltages. Most transistors are specified to work with a collector voltage around 10 V but in order for the oscillator to start this transistor needs to have decent beta and low Vces with maybe 30 milli volts on the collector. Depending on the circuit values the size of the reverse bias spike on the base emitter junction might kill some transistors. A work around is to add a zener diode to protect the transistor. If high voltages are involved the collector breakdown voltage needs some headroom. This is the first time I've used Spice, a general-purpose circuit simulation program for nonlinear dc, nonlinear transient, and linear ac analyses. It came from UC Berkeley. 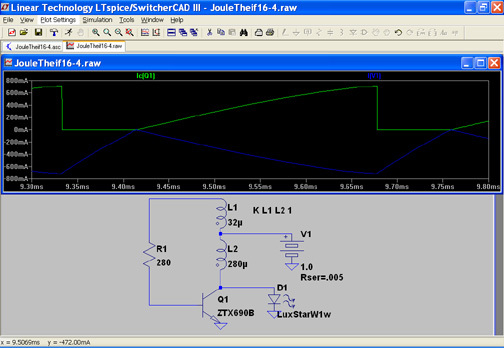 I'm using the free version from Linear Technology called SwCADIII. It has a a couple dozen NPN transistors built in. After trying all the transistors (and adding the ZTX690B) here are some results along with the spice model parameters. Note the energy stored in the inductor (that's needed to light the LED) is directly proportional to 1/2 * L * I^2. So doubling the current does much more good than doubling the inductance. 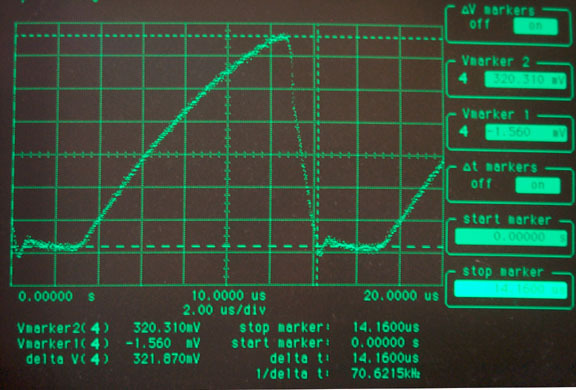 The point where the current ramp up stops iscontrolled by the transistor parameters. 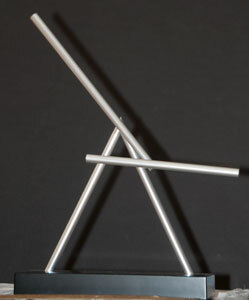 The model is a "T" configuration. 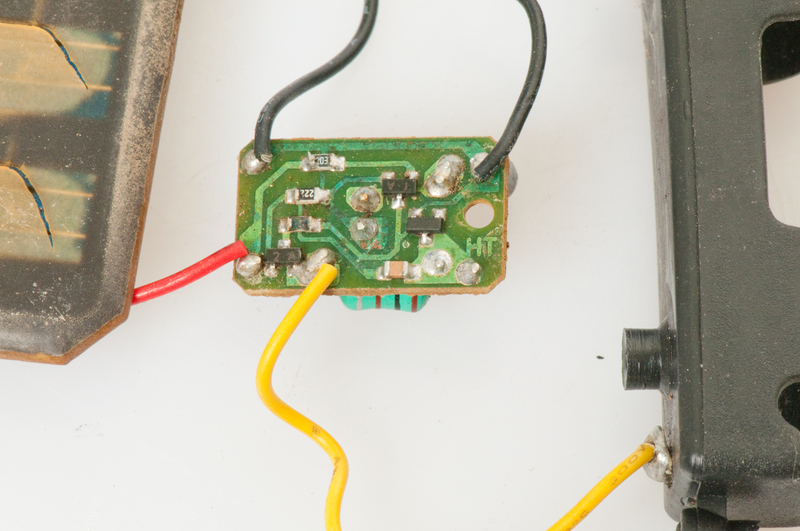 So RC gets added to RE for the collector emitter junction. In the data below the ZTX1048 has RC and RE values that are 50 to 300 times lower than those for the 2N2222. That alone may explain why it will allow more current to flow. 4 Ohms for RC + RE for the 2N2222 which limits the current to 1 Volt / 4 = 250 ma peak less than 125 ma for a ramp. 0.032 Ohms for RC + RE for the ZTX1048 plus the 0.030 in the inductor and battery total 0.062 Ohms for a current of 16 Amps peak. So something else is the limiting factor. By trying all the transistors some worked much better than others. When a Fair-Rite material type 85 (Square B-H Loop) is used with similar turns to the 73 material it does not work. The 85 material has an initial permeability of 900 compared to the 2500 of material 73. Also it takes about twice the magnetic field to saturate. I'm trying to figure out what windings need to be used to get it to work. There are diagnostic tests that can be done. These are more useful if you have a working unit to compare to hence the above waveforms. 9 May 2008 - I've been told that 85 material will NOT work for this application. 12 May 2008 - Using the same Fair-Rite material 73 core (p/n 2673002402) and winding the primary with 22 AWG (13") you can get 16 turns on in one layer. The secondary (base drive) winding is 4 turns of 28 AWG (7") since that's the spool I grabbed first. 32 uH and a resistance (40 milli Ohms) far lower than the fixed resistors used in series. The idea is to use all the first layer with heavy wire to maximize the energy stored in the primary. Base resistor optimized at 280 Ohms. Collector current peak about 520 ma. Collector voltage peak 3.47 V.
Power supply at 1.00 Volts and the current is 135 ma. Using the measured values for the transformer and base resistor and the ZTX690B model from Zetex and the 1 Watt LumiLED model from Candle Power Forums. in blue the battery current. The current scale is -800 to 0 to +800 ma. The Spice simulation is in the ball park but has more error than I'd like to see. Don't know how close it should be. In one of the early Brown Flux Gate patents he shows a capacitor across R1. Then later says that it's not physically present, but rather is due to the distributed capacity of the transformer. It may be an idea to include C1 in parallel with R1 to get better correlation between the SPICE model and reality? The other thing that would help is a model of the LED that better matches it's I-V performance and includes some measure of the light output. 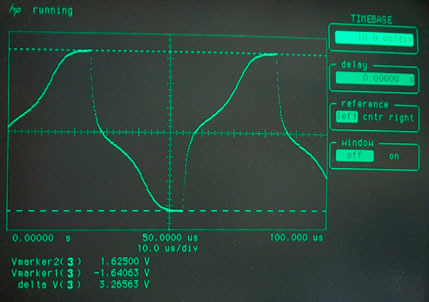 This plot below shows the collector current and the LED current. The key thing to notice is the the current through the coil stays the same just after the transistor openes as just before. That's to say that when the transistor opens the magnetic field collapses instead of expanding to maintain the same current. 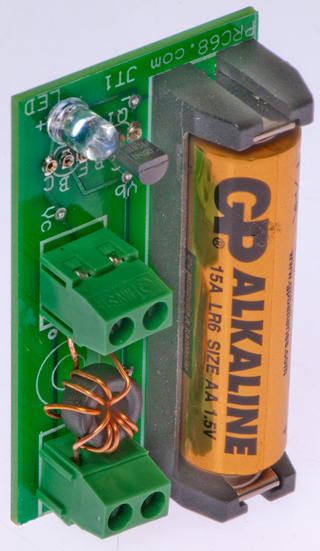 In the spice model if the LED is disconnected (and the anode tied to ground) then the voltage on the collector peaks at 4 kV and 838 us wide at 2 kV. I expect that the transistor would be smoked if the LED connection opens. To check the LuxStarW1w Spice model here is some measured data on the LED used in this circuit. The model is not very good. By opening the connection between T1A-1 and R1 the circuit stops oscillating. 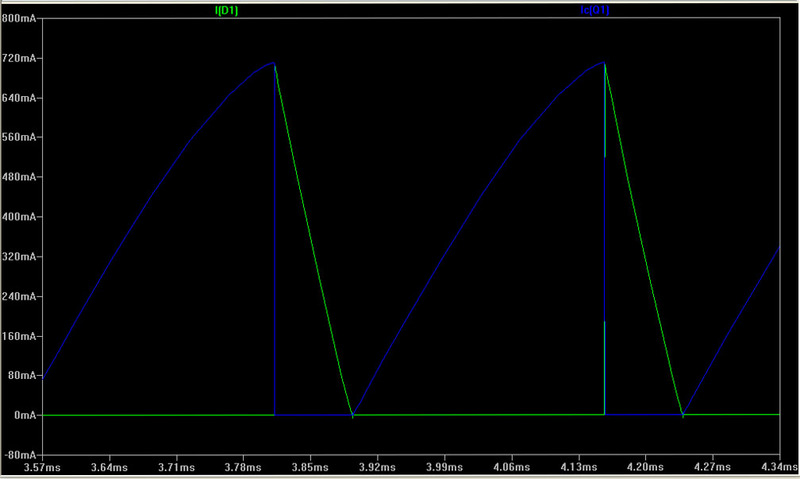 A signal generator can be used to drive R1 (which is high enough impedance that the generator impedance does not matter) and the output from T1A-1 when terminated with 1 k Ohm to ground can be measured. This is on a smaller core than all of the above transformers. 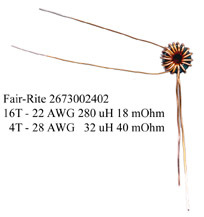 A Fair-Rite 2673022401, O.D. 0.2, I.D. 1/16", height 1/4". Five turns of 26 AWG just fits and is about 84uH, but then there's no room for the secondary winding, so 28 AWG was used. Five turns of 28 AWG on the primary 82uH & 38 mOhm. Base resistor optimized at 758 Ohms. Collector current peak about 427 ma. Collector voltage peak 3.16 V.
Power supply at 1.00 Volts and the current is 168 ma. There are a number of circuit topologies that may work, but all of them need transformers that are very special, hence this investigation of cores. Starting with the Fair-Rite Shield Bead Kit that contains 20 different sizes of single hole cylindrical beads using 43 & 73 material. But these are not specified for inductors or transformers. The 52 turn sample is shown in the photo at left. That's the max number of turns for a single layer. Adding a second layer will require making a smaller diameter hand shuttle so that's where it got stopped. 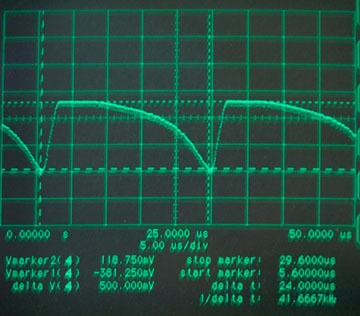 Test setup is an HP 33120A Function Generator that has 50 Ohms internal source resistance and an open circuit voltage that's twice the displayed number (10 Vpp max). 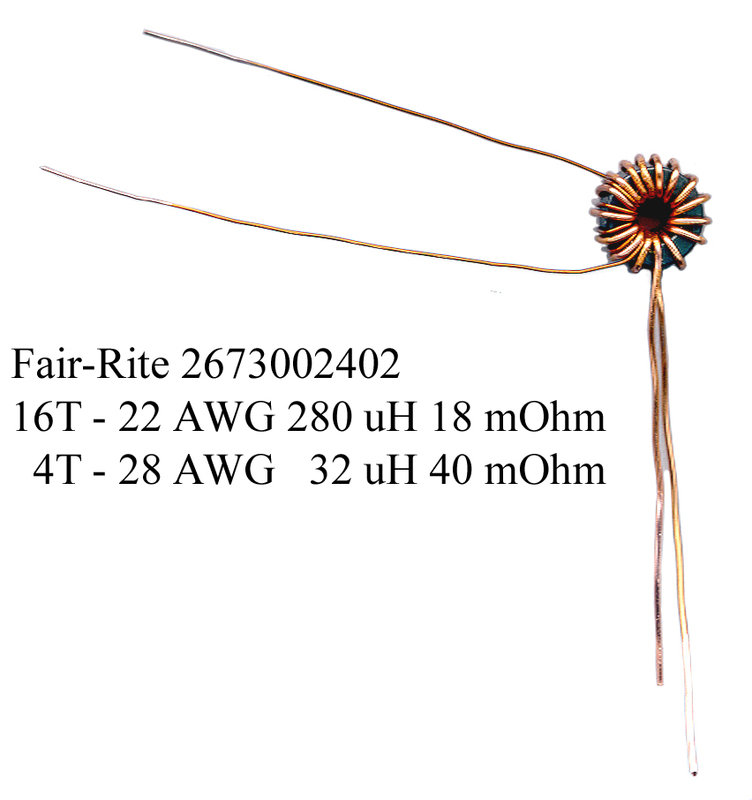 Drives the toroid (bead) with some number of turns then a 10 Ohm resistor to ground. 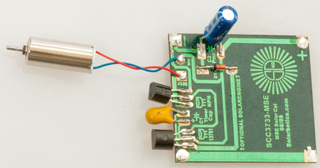 Scope connected across resistor to monitor current. There's a small 10 Ohm resistor between the white and black clips going to the scope. 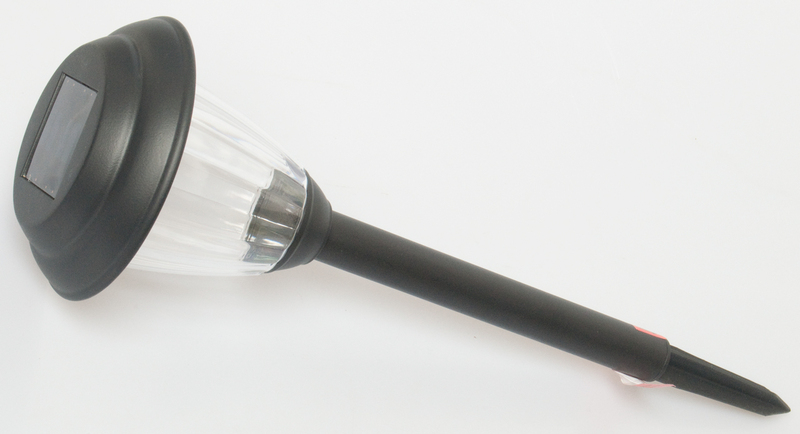 The wood disk with a Flashlight E10 socket is just holding the thumb nuts that make it very easy to connect to the fine wire. Clips do a poor job on fine wire. Note the inverted windings on the transformer wiring. Also note that if T1A, R1 and Q1 are removed the LED is powered driectly from the power supply through T1B. When this is done the LED will not light until the voltage gets to about 3.3 volts. 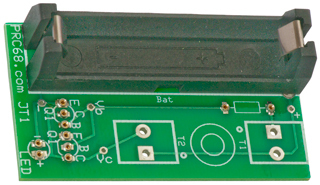 The back EMF from T1B gets added to the supply voltage, it does not need to supply all the voltage. Starting with the largest bead assuming that all the rest will need less drive. p/n: 2643002402 Material: 43 OD: 0.38" ID: 0.197" Len: 0.19"
Wire: 30 AWG 2 feet long. 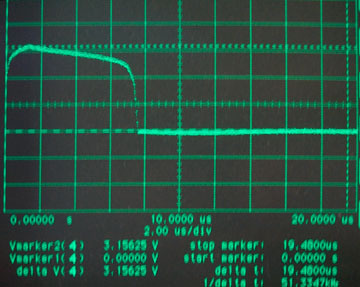 Max current available is 20 V / (50 + 10) Ohms or 333 ma and the max voltage on the scope (across 10 Ohms) = 3.33 Vpp or 1.66 V 00-p.
At the instant the inductor is connected to a voltage source the current is zero and ramps up linearly with a time constant (L/R) until it gets to the max current. But, if the core saturates the rate of change is slower causing reverse voltage at the secondary. The corner of saturation on the 43 material is not as abrubt as on "square" materials like 85. As the number of turns is increased the saturation effect becomes more pronounced. As more turns are added the resistance of the wire increases reducing the current. More turns means less amp turns. With 20 volts open ckt drive (60 Ohms loop resistance) after about 20 us the core is saturated. currve, it really snaps up. But when turning off it's slow. 14 Apr 2008 - stacked two of the 73 material cores and wound about 50 turns of a wire pair , i.e. to make a 1:1 transformer to see what would be different. With 3.6 V the LED is brightest. this plot does not have much meaning. timing same as base trace below. Dual 73 core saturation test. 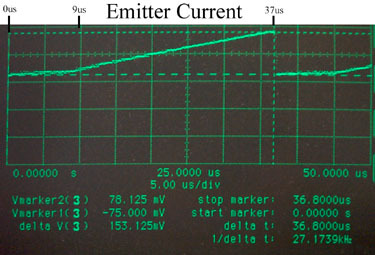 Current displayed as voltage across 10 ohm. wave 20 volts pk-pk from 50 ohms. Loop resistance a little more than 60 ohms. 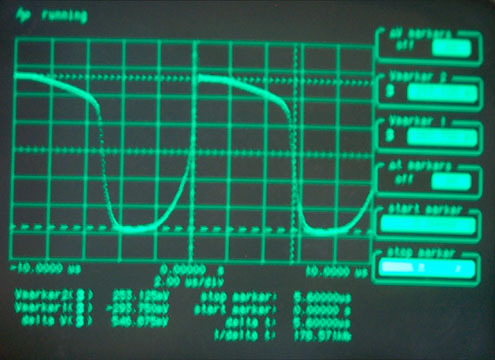 top & bottom of waveform are +/- 166 ma. Trigger at left edge of scope. after switching from + to - the current has a linear ramp for 152 us then saturation lets the current jump to - 166 ma. The current just prior to saturation is about 1/2 square or 0.25 volts across 10 ohms or 0.025 Amps or 25 ma. about 100 turns so saturation is at about 2.5 Amp Turns. 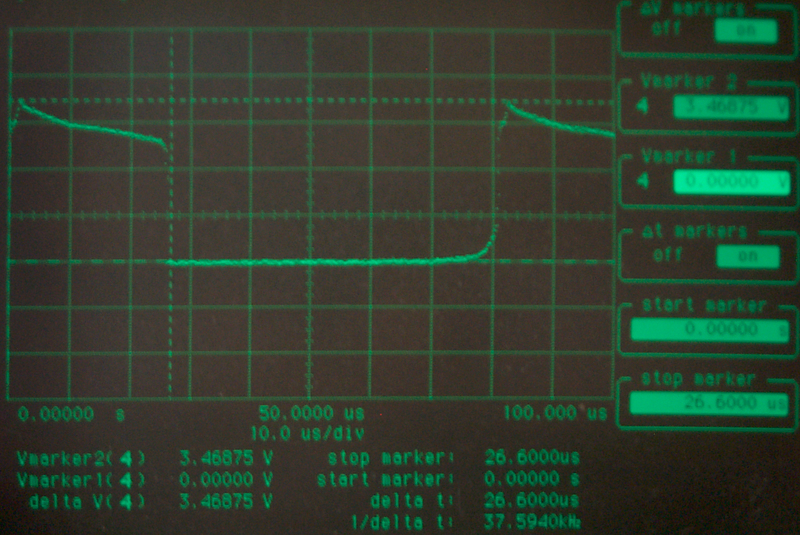 The inductance readings on the HP4332 don't look stable. Moving the meter away from the computer & monitor shows 6 mH center tap to either end, but no reading for the full winding. Wound on 4 feet about 47 turns and added to the collector side so primary is about 50 T and secondary is about 97 T.
Dual 73 mat 50T:97T Base 1 volt P.S. 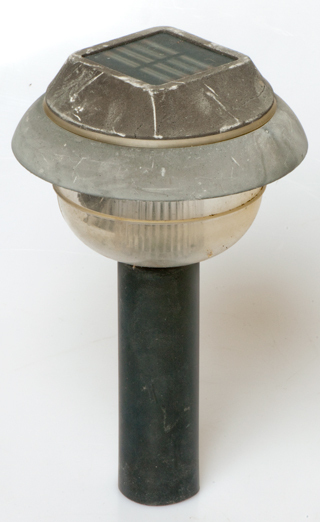 The left end of the top (intersection of H&V markers) is +650 mv and the right top is +743 mv. Width of the top is 672 us. Dual 73 mat 50T:97TCollector 1 volt P.S. The bottom left is 0.0 volts ramping up to + 203 mv. 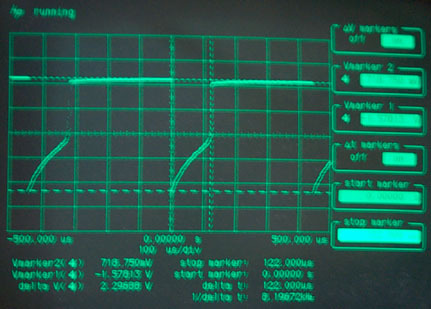 In the above collector waveform the LED voltage is the same as the collector voltage so the LED is on at the left edge. Starting in 1 3/4 squares where the collector voltage is zero the LED is off and the transistor is on hard with the current in the collector inductor linearly ramping up with a limiting value of (1.0 V - Vces)/ 0.977 Ohms (resistance of the 97 turn collector inductance). When Vc gets to about 0.2 volts the core saturates (5 squares in or after 672 us of ramping current. At this point the current in the core is (1.0 - 0.2) / .977 = 0.81 Amp so it's taking 0.81A * 97T = 79 Amp Turns to saturate. The energy in the magnetic field should be 0.5 * L * I ^2. Just prior to saturation the value of L would be about what it was when the current was zero and a number that's hard to measure with the HP 4332A (need the HP 4395A for this). When the core has saturated it can no longer contribute more magnetic field so the rate of increase slows down. This change in rate is what causes a voltage to appear in the other winding and turn off the transistor. The base voltage goes a little below zero volts. The transistor has been turned off so Ic = zero. As the magnetic filed colapses it supplies power to the LED. Just after saturation Vc is + 2.89, but 1.0 V of that is the power supply so the voltage across the coil is 2.89 - 1.0 = 1.89 Volts. 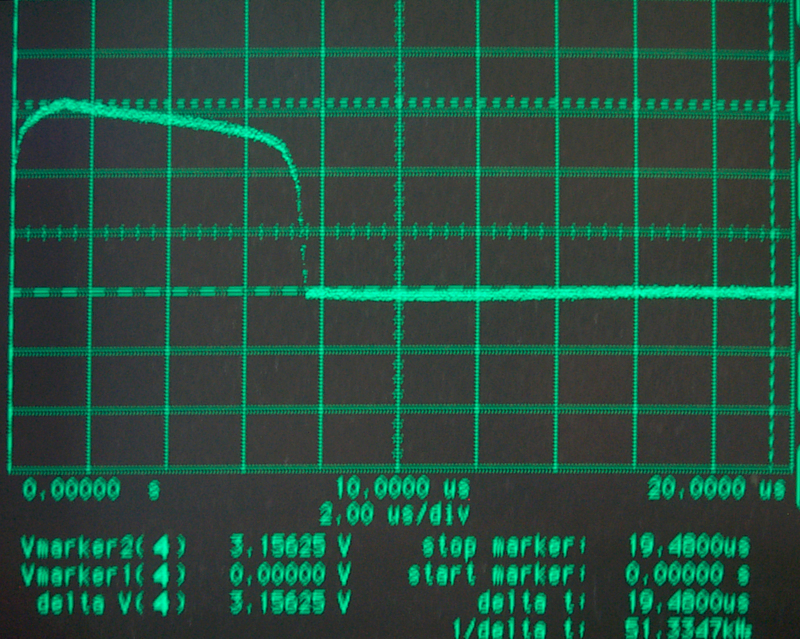 The LED has a good heat sink so the values measured below are fairly close to what's happening in the circuit. The LED duty cycle is 368 us / (368 + 672) or 35% and the average current is about 37 ma for an overall average current of about 13 ma. When the LED is driven directly from the power supply at 13 ma DC the brightness is about the same as from the Joule Thief circuit with 1.0 V P.S. The LED is turned on using the power stored in the collector coil and when that energy runs out the LED turns off and the core comes out of saturation. The Amp Turns for saturation are not consistent in the above data. What happens to the magnetic field energy, coil inductance and coil current when the core saturates is not clear. If a second layer of wire is added then the magnetic core is not filling the inside diameter of that winding and so has less effect. So the more layers of winding that are added the lower the contribution of the core. The most efficient toroid winding method is a single layer using the largest diameter wire that will allow the core to be covered with no more that a wire diameter exposed. If you really want to press this the wire should have a square or rectangular cross section. Most transistors have a specified working VCE on the order of 5 or 10 Volts so they don't work too well at 1 Volt. 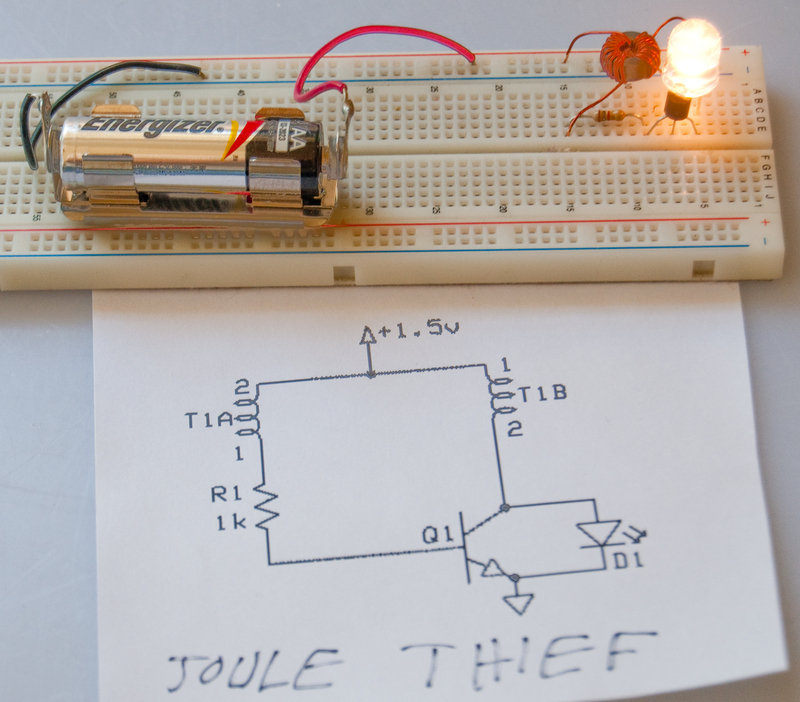 It turns out that there's a strong similarity between the Joule Thief circuit and some "motor circuits". 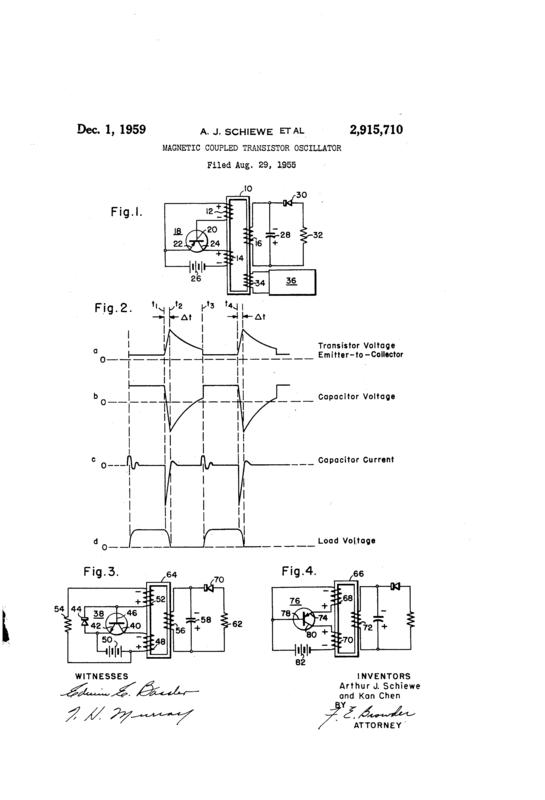 Patent 3783550 Novelty Electric Motor by Roger Wayne Andrews, Jan 8, 1974 includes what amounts to the Joule Thief circuit, but instead of using a battery it gets the transistor base drive from a magnet moving past a coil. 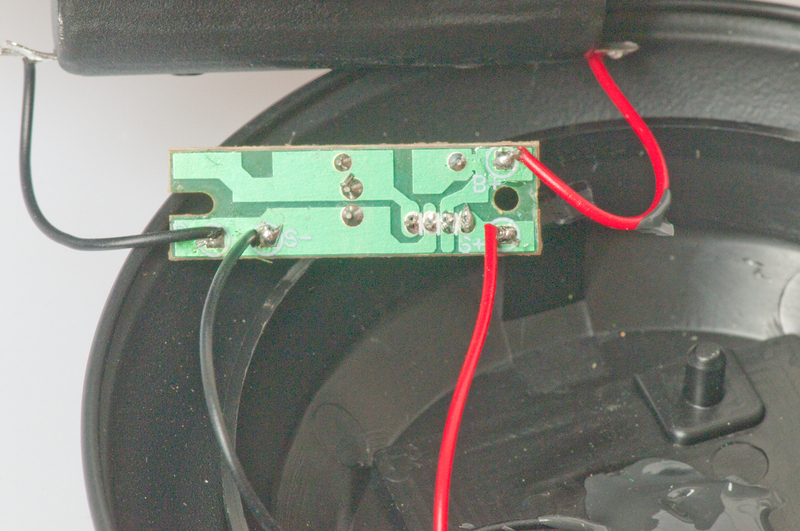 That switches the collector circuit repelling the magnet from the coil. This is very similar to how the Zendulum works. It's also the main principle of the Bedini (Wiki) and Newman (Wiki) "motors" that really are not motors in the sense that they convert electricity to mechanical motion, the way they are used is converting DC electricity to pulse electricity, very much how the Joule Thief converts DC electricity to pulse electricity. 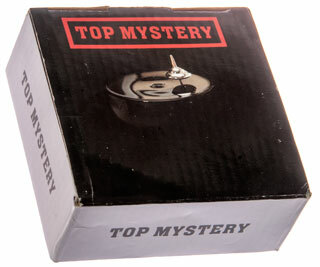 When the top is not spinning the current draw is less than a micro amp, but when spinning it more like 1 or 2 milli amps. It also attracted a mosquito. The operation may be improved by slightly tipping the unit rather than having it on a level table top. The amount of off level of the base is critical for operation. 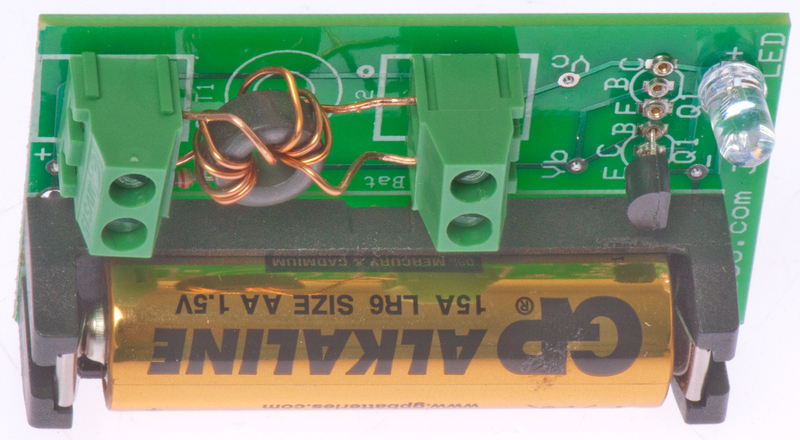 Fig 3 Just a tapped electromagnet, transistor and battery. Note that the Miller Solar Engine circuit can be used to drive motors from very weak DC power from solar panels. Magnet Motor - Kicker - same circuit shown in patent 3783550 above, but with very large home made coil. This appeared on the desk of Pepper Potts in the Movie Iron Man 2 (IMDB, YouTube: Strawberries Scene). There are two versions. The original version has metal sticks and will run for a year on 4 AA batteries. It's about 10" from the table top to the fixed triangle point. 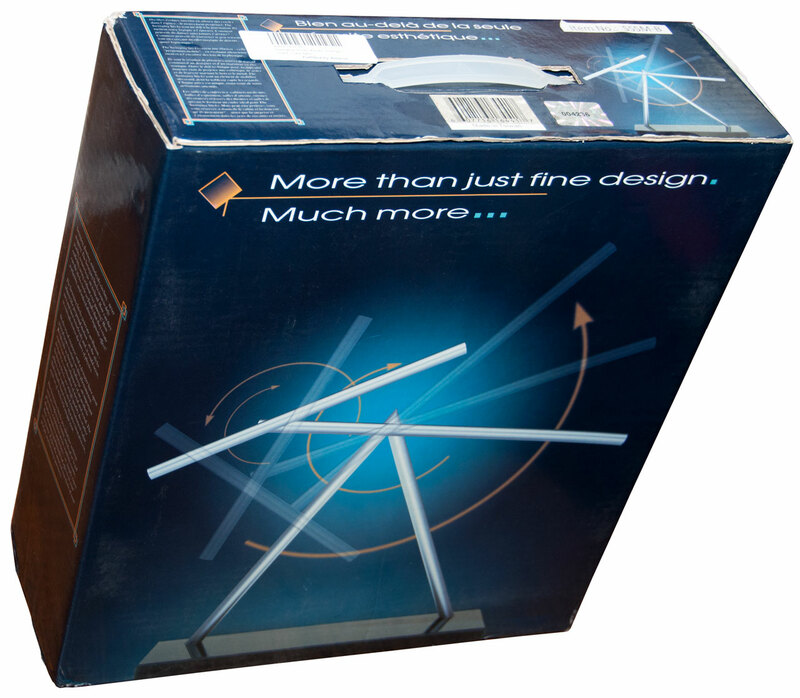 The "toy" version uses plastic sticks and runs for less time. While one web page says it uses the circuit from patent 3783550 Novelty Electric Motor (see above) I do not think that's the case. This YouTube (Swinging sticks kinetic sculpture circuit) has photos of the top and bottom of the board. It does not contain a microprocessor, just discrete analog components. Rather than the explanation given in his first YouTube (How Swinging Stick Kinetic Sculptures Work) that the two side coils are used to measure the speed of the main stick, I think the two side coils are used as the trigger for the electromagnet. 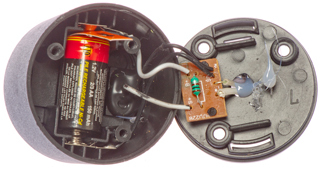 Note in the Novelty Electric Motor part of the coil is for sensing the magnet and part if for the driving electromagnet. I think here there are two sensing coils and a separate central electromagnet. The design is based on a double pendulum (Wiki) which exhibits chaotic behavior. when removing the sticks from the foam. It was supposed to be shipped with the sticks in the bag. 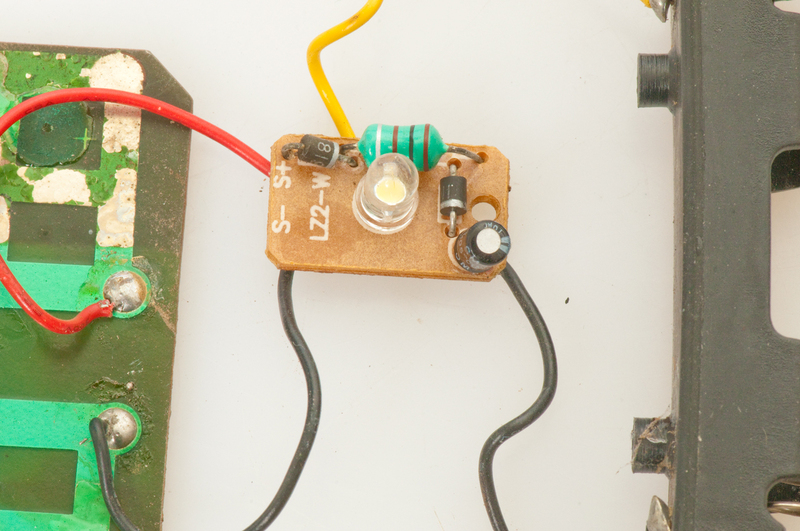 These electric fly swatters make use of the Joule Thief circuit with an extra transformer winding to generate the high voltage. 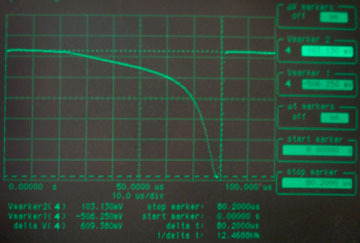 Some use a Cockcroft-Walton high voltage multiplier to increase the voltage (Wiki). 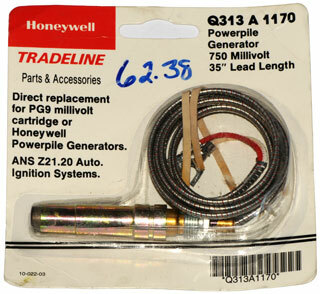 2881554 Fly swatter, Laine Thomas H, Apr 14, 1959, 43/137, 43/112, D22/124 - similar to a model A car ignition, i.e. 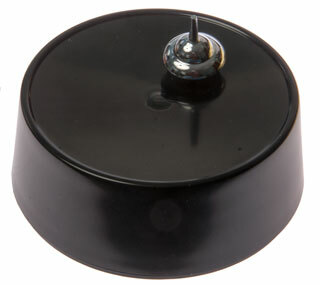 a buzzer in the primary of a transformer. 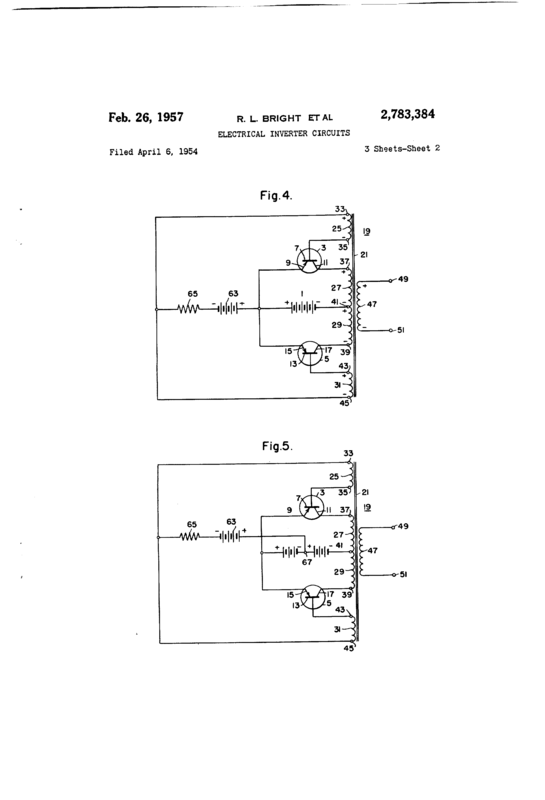 5886886 Voltage multiplier for a power supply unit of an electronic insect-killer device, Shie-Ning Teng, Mar 23, 1999, 363/59, 361/749 - why granted? 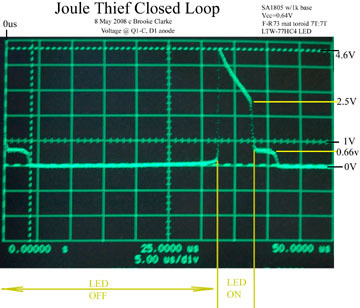 JouleThief Advanced Converter by KO4BB - it has current regulation to the LED - someone who knows a lot more about the Linear Tech software than I do. page created 8 May 2008.